What can you, as the owner of an ice cream parlor or a gelato shop learn from looking at this cake companies shiny little delivery truck? In essence, it is an excellent example of how branding your vehicle can create customer curiousity. 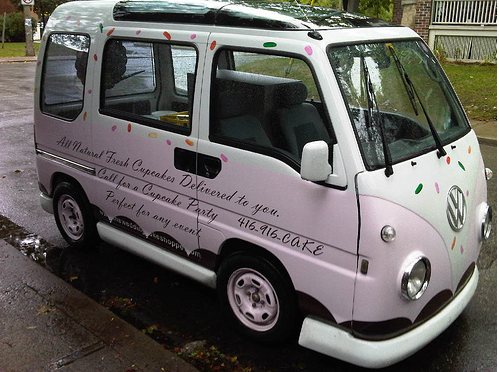 This little van which is the delivery vehicle for the Wedding Cakes Shoppe in Toronto, Ontario is seen toodling around neighbourhoods delivering cakes and cupcakes to various customers. 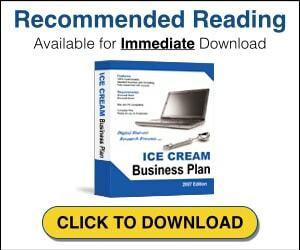 It is a good example of how you can use a vehicle to get your basic coordinates and what you sell or do to your customers. Furthermore it is white and covered with large multi-colored “sprinkles” which make it hard not to notice as it drives down the street. If you are in the food industry it is important to also look as cute and hygenic as possible. Nobody wants to buy cupcakes, gelato or soft yogurt from anywhere that is associated with dirty or grey griminess. This little car is pristine, shiny and kept clean as a whistle. It is also painted in the right colors – vanilla white and strawberry pink. Even the hub caps on this beautiful little car are painted pink. 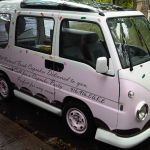 Even though most ice cream parlors do not deliver, this little car gives you an idea of how important it can be to have your business name on your vehicle and how it can spread the word about who you are and how your conduct your business. In this case too, the message of the business is about how they are eco-conscious as this is an energy saving vehicle. Many people are attracted to that nowadays. Copyright Donna Lypchuk 2011. All Rights Reserved.